Dark Angels of Darkness is a comic that’s been floating around my house for a few months now. I can’t seem to get it onto a shelf – that’s a good sign in my book-cluttered home. 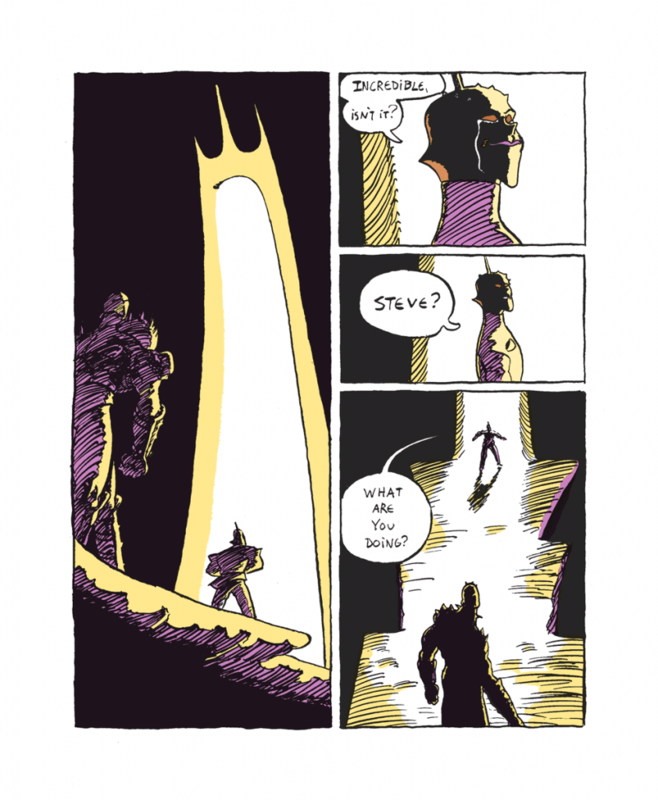 The comic is a recent release from Peow Press, and it’s a selection that falls well into their wheelhouse. Dark Angels of Darkness is a science fantasy genre comic where a great power struggle is brewing between the supreme leader of the world, a godlike being named Imperius Rhâââ, and a military mastermind named Megan. To accomplish the coup and assume the throne of Imperius Rhâââ, Megan will need to build a team of the world’s most powerful soldiers and use the power of fusion, a power that is forbidden by Imperius Rhâââ. This central plot of Dark Angels of Darkness is not immediately apparent. In the opening of the book, we see two characters on a smoldering wasteland embracing each other erotically. There, the two fuse together, becoming one person. 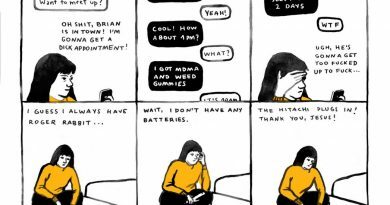 Gofa sets the tone with this initial scene; this is a comic that is wry, and a little weird, but ultimately it is a comic that is about affection – Gofa’s affection for a specific type of comics. 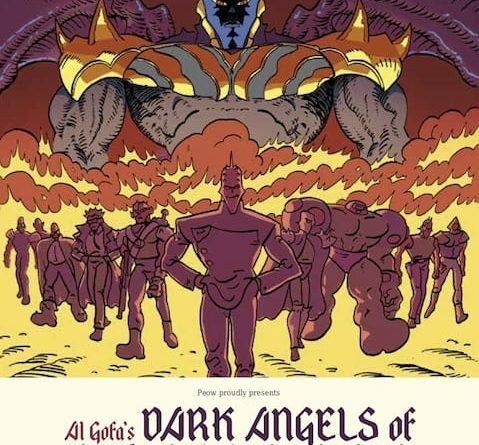 There are plenty of ways to love something and Al Gofa’s Dark Angels of Darkness is nothing if not a love song. Dark Angels of Darkness homages some of the most popular shonen manga of the last 30 years. 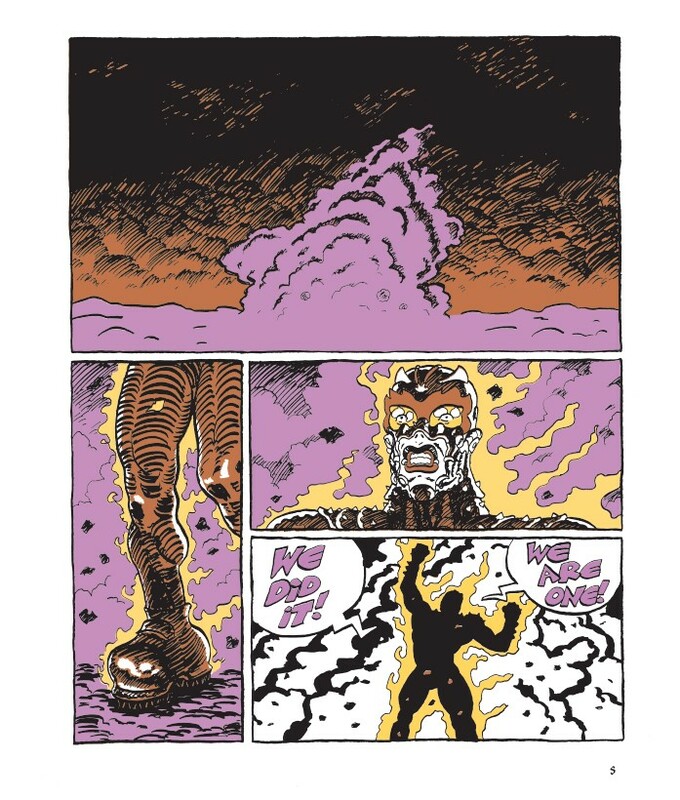 The forbidden power of fusion, for example, could be referenced to Akira Toriyama’s Dragon Ball Z, or even further back to Go Nagai’s Devilman. And like those comics, Dark Angels of Darkness exudes a sort of self-aware silliness. There are massive fights filled with off-kilter comments, action scenes that are so busy they’re almost incomprehensible, and character sheets like something you’d see straight off the back of a G.I. Joe action figure package in the 90’s. What the characters are actually fighting for seems to be a bleak desert, and there doesn’t seem to be much in the way of explanation for anything that’s going on, so at some points Dark Angels of Darkness feels like someone playing with action figures rather than telling a story. Dark Angels of Darkness is raucous and wild, but not all that serious. Despite his blasé treatment of plot, Al Gofa is dead serious about his line. This is the real joy of Dark Angels of Darkness, and why I keep flipping through the book. This comic is drawn is with an intensity and power unmatched by anything I read in the last 12 months. I loved looking at the drawings in this book, and it’s clear that Gofa enjoyed drawing it. And in this way Gofa still harkens back to the cartoonists he’s homaging. Most of those cartoonists, whether its Go Nagai or Hirohiko Araki, have a distinct style focused on strong lines. It’s a match made in heaven (or maybe in this case, hell). As a first introduction to Al Gofa and his work, Dark Angels of Darkness shows us a cartoonist who is serious about drawing, and good at it to boot. But in order to make a stellar comic, Gofa will need to put as much attention into his writing as he does his drawing. Dark Angels of Darkness is a fun read, and for the drawings alone is worth a look. But it isn’t the full package – we’ll see if we can get that with his next book.